If you look through what most kitchen retailers have to offer, you might feel like Dorothy before she travels to Oz: trapped in a world of the same old neutrals. Luckily, customers don’t need a tornado to escape this tired trend – they just need IKEA. If you look at the IKEA kitchen catalog and only see white or beige options, you’re not looking hard enough. Inspired Kitchen Design customers choose IKEA because they love the customization options, and more and more these days, what they want to customize is color. Our customers know it’s more cost effective to buy and paint an IKEA cabinet door than it is to find a manufacturer who carries the hue of their hearts. Now, IKEA does offer a few out-of-the-box colors and patterns beyond the standards selection: for example, there’s the high-gloss orange and even the Kalvia accent door with a unique black and white pattern. BUT IKD kitchen customers in search of colorful cabinets still choose IKEA. Even though IKEA doesn’t explicitly offer the whole rainbow, they do offer inexpensive, easily painted Torhamn doors that are ready to assemble. Finding unpainted doors is challenging enough without the added hurdle of then matching those doors to a cabinet box. With wooden IKEA cabinet doors such as Torhamn, customers can skip the matching and get right to the sanding. Plus, IKEA cabinets are frameless, and you know what that means: you can skip painting the frame, too, and only worry about the door. IKEA makes customizing their kitchens even easier than clicking your heels. IKEA makes customization easy for the customer while also making it easy on themselves. Rather than having to anticipate which colors will be in high demand, they let the customer decide. Our customers are happy to oblige, because when they look through what IKEA has to offer, they don’t see white and beige: they see possibilities. If you’re looking for help designing your custom IKEA kitchen, why not work with us. There’s plenty of reasons why you need an independent IKEA installer. You’re not a D-I-Y type or you think IKEA’s install price is too high. IKEA won’t install if their cabinets are modified. Could be that you live outside of IKEA’s service area or want a general remodeler. Maybe you don’t want to deal with IKEA and their installers. Some folks want to tackle most of the IKEA kitchen process online. They’d like to hire a kitchen measurement service, get an IKEA kitchen design, find an IKEA installer and get an installed kitchen quote – all online. Trouble is, IKEA doesn’t work this way. Our customers here at Inspired Kitchen Design (IKD) had these problems. So we went to work finding them potential installers in Canada and the US. We kept going until we assembled a database of hundreds of capable companies across North America. We called our new IKEA kitchen installer locator service “Install Connect”. Some fantastic kitchen installers don’t have websites or aren’t active on social media. Their customers find them by good old word of mouth. Thankfully, some of their happy customers commented about them on assorted rating sites. Setting out to find the best installers in North America, we pored over these sites, got their names; found their phone numbers and called. After interviewing them we saw what many lacked in marketing skills they more than made up for in their IKEA kitchen install abilities. Some capable IKEA installers don’t mention IKEA on their websites because they’re just too busy. We came to their sites “sideways” after asking around and investigating. Most were general remodelers but install IKEA kitchens along with a full remodel. There’s plenty of fake installer reviews and recommendations out there on the web. We’ve seen the same crap copy used time and time again as we reviewed thousands of comments from about ten sites that specialize in customer ratings. When you understand IKEA cabinets as well as we do, it’s easy to see through the false reviews. Negative comments were looked at as a proportion of the total reviews. You’d be hard-pressed to find any business without a negative comment. The trick was to compare them to all the positives and to understand if the unhappy customer was venting about something more than the installer. Sometimes this happens during kitchen remodels. When selecting the very best installers for our online Install Connect service, installers with a high proportion of negative customer experiences were disqualified. Capable IKEA installers are very busy and often don’t have office staff. We wanted to talk to them personally as a further check but found it hard to get them on the phone. We were persistent though and discovered that the best time to reach them was from4:00 pm to 6:00 pm. As well as learning as much as we could about the kitchen installer services they offered, we also wanted to know what they had to say about their customers and IKEA’s cabinets. We learned a few good design pointers. We could only call so much though; the ones that never answered were disqualified. IKD customers are usually remodeling most of their kitchen. They want an installer who can handle the whole project. We paid special attention to general remodelers who had experience installing IKEA cabinets. Their skills are fully outlined in Install Connect. Finding capable IKEA installers requires a mix of persistence, intuition and organization. We’ve found over 200 in Canada and the US. In smaller cities also. 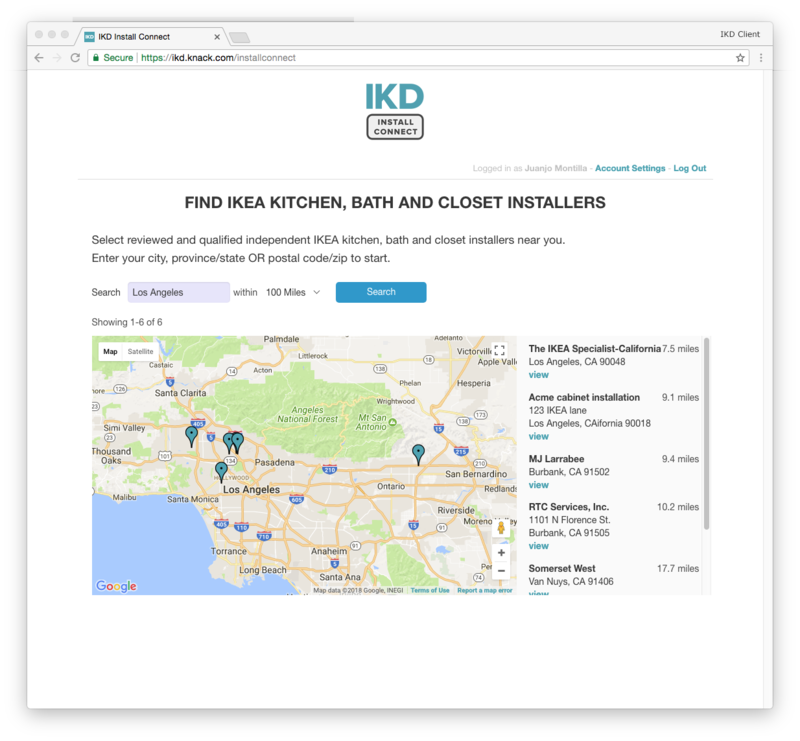 Now IKD customers have more options than hiring IKEA’s installers or doing it themselves. 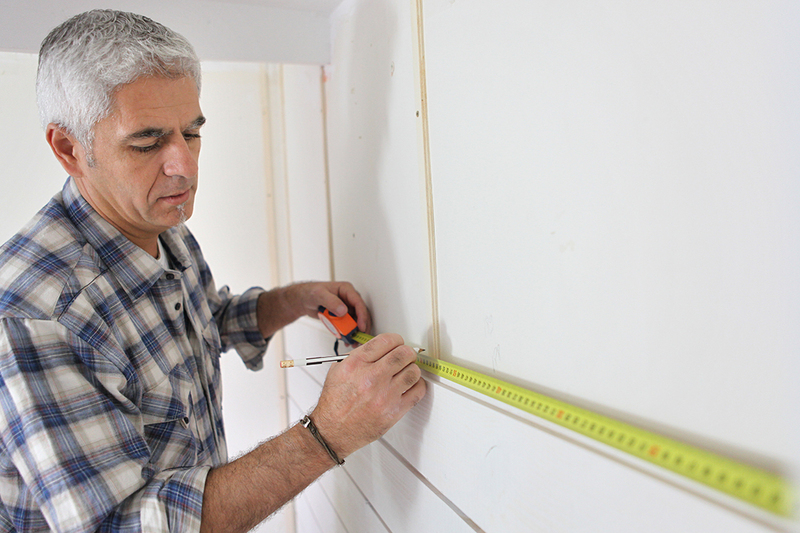 With Install Connect you’ll find an installer, get a kitchen measurement; an IKEA kitchen design and installation quote – all online. One of Jason and Shannon’s top wishes for their new home build was a kitchen that made the most of their view of Okanagan Lake and the surrounding mountains. The couple also wanted a European style IKEA kitchen laid out in an open way. After struggling to make the IKEA Kitchen Planner work, they found IKD and it handed it over to us. The kitchen really is the heart of the home. It’s the room where we cook, socialize, and spend time together every day. Even if you’ve got a house full of teens who would rather walk over a field of hot coals than watch Netflix with you in the evening, they still make an appearance in the kitchen, demanding to be fed! Like all rooms in your home, the kitchen has undergone significant changes. But maybe more than any room, it’s the one where technical development has arguably had the most impact. What was once a pretty grim place, home to a whole host of major health hazards, has clean running hot water nowadays. Waste disposal is elegantly handled. And there’s a wide range of appliances, gadgets and gimmicks to help you prepare and cook food. If we really need to put it in context, the refrigerator – something now taken utterly for granted – didn’t make its way into our homes until the 1930s, the freezer until the fifties. That’s nothing more than a nanosecond in the history of humanity. Still, the next decade will see even more changes. Smart and integrated high-technical solutions have already started to impact the kitchen and we’re getting closer and closer to the point where it’s likely that our handheld networked devices will help us control the kitchen even more. Just as technology has changed, kitchen design choices have changed. Once it was all about farmhouse kitchens, then kitchens with chrome finishings left, right and center. Natural woods are popular in 2018, but so are high quality quartz countertops. When it comes to design changes, we could go on and on. Something that never changes though is good planning! If you’re looking to remodel your kitchen, functionality should be the keyword from the get-go. At the heart of planning, is what we at Inspired Kitchen Design refer to as the golden triangle: the ratio between sink, fridge and stove. The golden triangle is an important design concept that improves a kitchen’s functionality by keeping the walking distance between the sink, refrigerator, and stove to the minimum. As a rule of thumb, the total distance between the three points of the triangle should be no more than 26 feet; each stretch of the triangle should measure approximately 5-8 feet. If you’re remodelling an existing kitchen, the triangle should already be there so you have a pretty good guide as to where your new IKEA units should go. Most folks don’t want the expensive hassle of changing the placement of water and power outlets so tend to stick with the triangle in place; but that’s not to say you shouldn’t. Some solutions, only a designer can see. A completely new install is always going to be pretty overwhelming if you’ve never designed a kitchen before. This is why newly built houses often include a set kitchen design to ensure that the cabinets and work surfaces fit. Because we all want to set our own stamp on a new build, we may want to rearrange things to personalize them. This is fine if you know what you’re doing or you’re working with a dedicated kitchen designer, but it can be risky if you put your faith in your installers who may listen to your requests without the necessary kitchen design know-how. One thing that we often see in new builds, or when customers start to talk to us about remodels, is that people forget to avoid major traffic walkways through the triangle. What might look good in an IKEA showroom or design magazine, my not be entirely practical for the space of your home. In all our design projects, we ensure that your kitchen has the optimum golden triangle, and that walkways are efficient and natural, as well as looking good. If you’re going it alone with your IKEA kitchen design, ensure that any sink has at least 24 inches on one side and no less than 18 inches on the other. If you don’t, you won’t have sufficient drying space or space to put things. The nearest edge of the dishwasher should be no less than 36 inches of the nearest edge of a sink. Although your dishwasher instructions might say that it’s safe to put items into the machine without ringing, we all know how much a quick rinse removes food and reduces the chance of your machine blocking over time! At present we recommend that your IKEA kitchen has at least 158 total inches of countertop space where you can work or place items like a toaster, kettle, food mixer, coffee grinder, etc. Anything less is going to feel cramped. If you’re living in a smaller apartment with limited kitchen space, it’s important not to scrimp on this or you’ll find cooking and preparing food stressful. Of the 158 inches, a 24-inch-span should be next to the sink for preparing food and allow 15 inches or more of countertop beside the handle side of the refrigerator or on either side of a side-by-side refrigerator. Allow at least 12 inches of countertop on one side of a cooking surface and 15 inches on the other. Then there is the seating area. If you don’t leave enough space behind chairs and stools, things are going to get very cramped indeed. We recommend leaving no less than 36 inches clear space behind the seating area, measured from the edge of the table top, and preferably 44 inches if it’s going to be one of the major walkways in the kitchen. When you go into the IKEA storeroom you’re seeing a kitchen that’s been optimized by outstanding designers. Yes, there’s a reason those kitchens feel just right when you walk in. Even though IKEA’s kitchens are designed to fit together with the optimum sizing we’ve outlined above, there are instances when customers get too creative in their thinking and simply get it wrong. This can be an expensive thing to change, particularly as once assembled, IKEA cabinets can be a little tricky to take down and put together again. That’s why if you’re looking for a solution that’s a little bit outside the box, you should talk to a company like us. We can help you ensure that your kitchen is well-designed, not just from an aesthetic point of view but also in terms of usability. Investing in a new kitchen is not cheap. But with IKD as your kitchen design team, working closely with you, you can bet that your investment in your brand new IKEA kitchen will be worth it. Why not start your kitchen design today! Here at IKD, to put it delicately, we’re no strangers to the challenges of IKEA assembly and installation. From the Home Planner, to critical missing pieces, to whimsical instructions, there’s no shortage of jokes about IKEA-related frustrations. Even trips to their stores can be a fraught experience for couples! If you don’t personally have an IKEA horror story, I’m willing to bet that someone you know does. Readers, I want you to do me a favor. Think of your own IKEA horror story, whether it was a backwards chair or a leaning tower of books. Did it end in triumph, or in tears? Heartbreak, or celebratory beers? I’d like you to multiply that memory by 5. Now, you have an idea of what IKD customer Jeff faced. Tasked with installing kitchens in 5 new rental units, Jeff installed every single one on his own. Think about that for a minute. Every screw and hinge. Every door, every light fixture, every cabinet. Each and every tiny frustration, five times. That’s what I call an IKEA horror story. Avery and Harper’s kitchen was, as my dear old grandmother would have said, “nothing to write home about.” Looking at it, you’d never know about the open concept revolution that’s been sweeping the kitchen world. Small and closed-off, it got barely any of the home’s abundant natural light. For a couple who liked to entertain, this kitchen simply would not do. Can you blame them? As we mentioned in last week’s post, people love to congregate in the kitchen during parties. But even when they weren’t hosting a gathering, Avery explained, “We didn’t want the space to divide cooking from eating.” That’s why Avery and Harper knew they needed an open concept IKEA kitchen design. They came to the right place (if I do say so myself). So, did Frank and Karen get a lot of “bang” for their buck? Take a look at their new IKEA kitchen and decide for yourself! There’s so much to love about this kitchen, I don’t even know where to start. Let’s take a closer look. What do you notice first when you look at Karen’s new IKEA kitchen? If you’re like me, it’s probably the dramatic contrast of the upper and lower cabinets. Frank and Karen knew they wanted flat-front cabinets, and both sets of doors are VOXTORP: white on top, walnut on the bottom. The next thing I notice is how much lighter everything is. Of course, knocking out a few walls will do that! But the combination of under cabinet, hanging globe, and ceiling lights did just as much to brighten up this kitchen. Of course, you can’t ignore just how clean and modern this IKEA kitchen is. From the flat-front cabinets, to the sleek island, to the brand new appliances, Karen’s kitchen has entered the 21st century. Also: check out those floating shelves. Not only are they beautiful, but they’re superhero-strong. Karen wanted her shelves to be able to hold 15-30 pounds, which proved to be a tall order. Luckily, her contractors custom-built these beauties for her. As an added bonus, the wood slides right off the inner base so she can paint behind the shelves if need be. Karen and Frank had a few end goals for their new IKEA kitchen. Number one: a 2-door oven. With two young children, Karen knew her family needed something energy efficient and useful. That 2-door oven should make family dinners a breeze to cook! Sidenote: all the appliances came from the Frigidaire gallery at Karen and Frank’s local Home Depot. The appliances all have a special coating to prevent smears and smudges – a definite bonus come cleanup time. Number two: a giant island that works overtime. Plenty of storage? Seating for extra guests? Thanksgiving dinner prep? Rolling out acres of dough for a Christmas cookie exchange? Karen’s island needed to be ready for anything she could throw at it. Number three: clever storage solutions. Beyond the standard kitchen work triangle, it’s important to streamline your kitchen to your unique needs. Karen took this to the next level by utilizing drawers within drawers. At long last, Karen and Frank have a beautiful new IKEA kitchen for all occasions. Whether they’re entertaining for the holidays, or just watching their children play outside as they prepare a quick lunch, this kitchen has it all. Whether you choose to ship, or make the trek, we’d like to add our own piece of advice. Those of you who want to take advantage of the next IKEA sale should get your design ASAP. Having that design in hand will make everything so much easier.